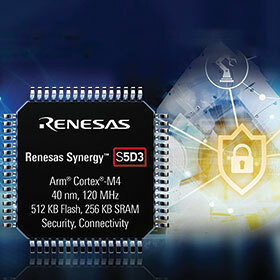 Renesas Electronics’ new highly integrated S5D3 MCUs (microcontrollers) simplify application development with their secure cryptographic engine and Synergy software package. Equipped with advanced security, the devices simplify designing cost-sensitive, low-power Internet of Things (IoT) endpoint devices. The MCUs offer 512 KB Flash memory and a large 256 KB SRAM memory. This 2:1 ratio of embedded Flash to SRAM supports intensive communication stack utilisation for robust IoT connectivity, and the 8 KB data Flash enables a great number of read/write cycles. Each S5D3 family member integrates several analog components including two 12-bit analog-to-digital converters (ADCs), a 2-channel 12-bit digital-to-analog converter (DAC), high-speed 6-channel comparator, temperature sensor, and a 6-channel programmable gain amplifier (PGA). They also offer a scalable set of 13 independent 32-bit general-purpose timers, and communications interfaces such as USB, CAN, I²C, SPI, SDHI and SSI. The Renesas Synergy platform is a fully supported software/hardware platform that enables development to begin at the application programming interface (API) level, reducing the complexity of designing security-aware connected devices and HMI systems with graphical user interfaces and capacitive touch.